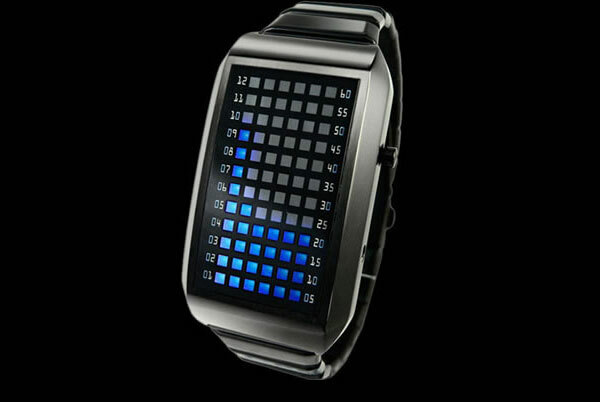 Here’s another high-tech watch creation from Tokyo Flash. The funky LED colour scheme can be changed to suit the user’s mood (white, orange, blue or multicoloured) To read the time the hours 1-12 are displayed in the left column, from the bottom to the top, minutes from the bottom right, each lit LED representing a single minute. The time can be read more quickly if you look at the numbers on the right, each row of lit LEDs is equal to five minutes. The date can be read in a similar way. Made from solid stainless steel and a mineral crystal lens, which actually makes those LED’s come to life on your screen, and it has a statement of its own.